On Tuesday nights every summer, in Randleman, NC, a group of CBA pilots participate in a special event for special kids. 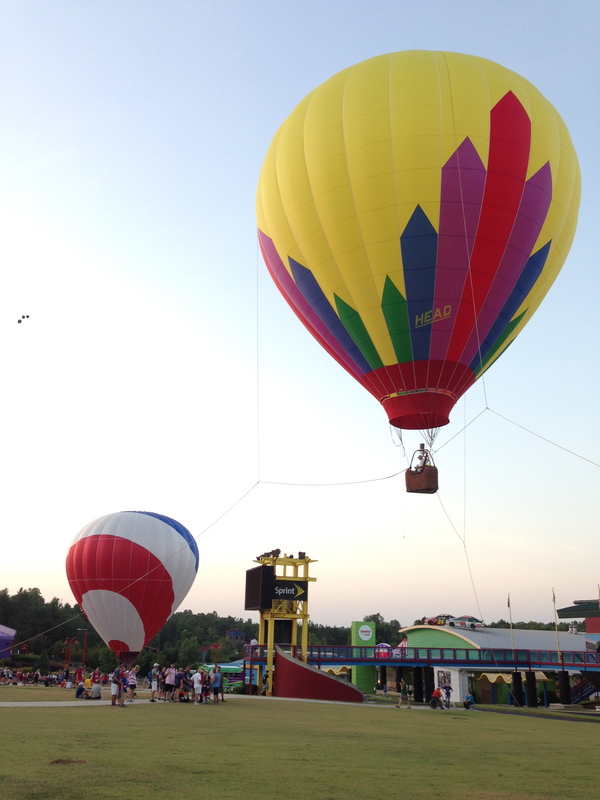 It’s NASCARnival night at the Victory Junction Gang Camp, and tethered balloon rides are one of the things that create excitement among the campers. There have been hot air balloons at NASCARnival since the event started ten years ago. Pilot Ruth Ludwick Lind, was involved with Victory Junction from the start. Her family donated the “Fab Shop”, where campers can get “makeovers” during the week, sporting creative hair designs using colorful temporary hair dye and gel. Ruth and her friend Marsha Treacy started organizing balloonists to tether. Ken Draughn has been involved since the beginning of the weekly tethering, and now heads up organizing balloonists for the event each summer. Each week, Draughn asks for two pilots to volunteer to bring balloons so all of the children (about a hundred each week) may get a chance to tether. If weather is bad, there is still a ballooning experience available for the children. Even in rainy or windy weather, a balloon is cold inflated in the gym, so kids can experience walking inside; or you may just see them doing gymnastics, taking pictures of themselves, or laying on a mat and enjoying the “big tent”. Eyes glow as these kids see the balloons, and big smiles appear on their faces. They love getting the opportunity to tether. Well, after the initial shock of how loud and the propane burner is and how hot the flame is that it creates! There are often a few yells and shrieks along the way, usually punctuated with laughter. Victory Junction’s mission is to provide a first class camping experience for kids aged six to sixteen, who are experiencing, or have experienced, severe illnesses. There also is a week of camp for the siblings of these kids. The estimated cost of sending one child to this camp is $2,500, but no child ever pays to come to Victory Junction. Donations cover the cost for all. The camp was started in 2004 by the racing family the Pettys, in honor of Kyle Petty’s son Adam, a driver who was killed in a racing accident while still a teenager. The camp sits on 84 acres in Randleman, donated by Adam’s grandparents Richard and Lynda Petty. arrive on camp property. A replica of Adam’s green #45 car is seen prominently on top of one of the buildings, “Adam’s Race Shop”. Here kids can put on a race car and sit in a race car. They can learn to change tires, or play video games. The camp has a water park, putt-putt course, fishing lake, horseback riding, movie theater, gymnasium, bowling alley…..almost any activity that you can imagine. There’s even a hot-air-balloon water tower that is a focal point of the camp. Another #45 car replica serves as the demo car that various racing team pit crews (often sporting feathered boas) use at NASCARival, as they compete against each other to show campers how very fast they can change tires. There’s also music, tattoos, and fun food like icees, popcorn and a doughnut dunking station operated by Krispy Kreme. Because of the medical needs of its campers, Victory Junction has a summer medical staff that includes a pediatrician, nurse practitioner, and four registered nurses. A volunteer medical professional also joins the staff each week. The medical team passes out all of the medications for the campers each week, but also staffs the Body Shop, which is the camp infirmary. The summer staff-to-camper ratio is high and supplemented by many volunteers who come from around the country to help with each camp. Draughn says that he is inspired with the determination shown by some of the most severely handicapped children as they conquer any obstacle that stands in the way of them riding in a balloon. Still, he said he thinks what has impressed him most over the years are the counselors (mostly college students) he gets to watch in action every week over the course of the summer.“It’s amazing, at their age, the dedication they put into these kids. I have never run across one yet that didn’t thoroughly enjoy what they were doing,” Draughn says. Most of the kids who attend a session at the Victory Junction Gang camps have already had many rough days in their life as they have battled illness or accidents. The balloonists who volunteer usually come back, often traveling from several hours away. Most find it’s a special place with joy that is infectious, and a great reminder that not only is ballooning an opportunity to put smiles on faces, but it is a way to celebrate life and health.